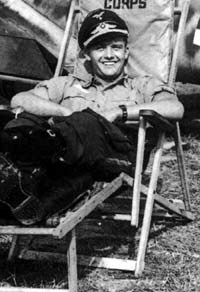 Gottfried Weiroster was serving with Jagdgruppe Süd, based in southern France, in August 1943. Leutnant Weiroster was assigned to the Stabsstaffel/JGr Süd. On 17 August 1943, Weiroster shot down two USAAF B-17 four-engine bombers. The Stabsstaffel/JGr Süd was redesignated Stabstaffel/JG 50, based at Wiesbaden-Erbenheim under the command of Major Hermann Graf (212 victories, RK-Br). The unit was tasked with the interception of the high-flying RAF Mosquito photo-reconnaisance aircraft but was also engaged in combatting the increasing Allied four-engine bomber raids of Germany. 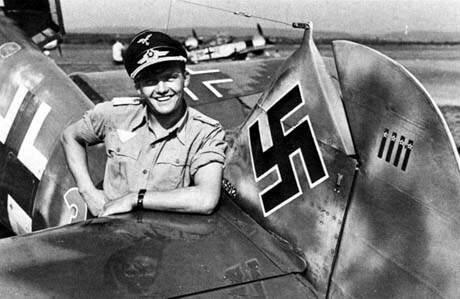 Lt. Gottfried Weiroster with his Bf 109 G-5/R6 (W.Nr. 15 912 ) "Red 3" of JGr. 50. The rudder shows four victories over American aircraft. Weiroster recorded at least one victory with the unit, another B-17 shot down between Calw and Bad Teinach on 6 September, before the unit was disbanded in October. On 12 November 1943, Weiroster was transferred to JG 11. Weiroster was shot down and killed in his Bf 109G-5/Y4 (W.Nr. 26 112) "Black <0" in aerial combat with USAAF four-engine bombers and escorting fighters over Jadebusen on 26 November 1943. Gottfried Weiroster was credited with 6 victories in 19 missions. He included at least three four-engine bombers in his victory total.